A FEW lines scrawled on a single sheet of paper are the only first-hand information we are ever likely to obtain of the greatest disaster in the history of Polar exploration. On May 19, 1845. Capt. Sir John Franklin, R.N., already famous as an Arctic explorer, sailed from England to complete the discovery of the North-West Passage. He had with him two splendid ships, the famous Erebus and Terror, manned by the pick of the Navy and provisioned for three years. He was revisiting a region which he had helped to explore and which British vessels had navigated for nearly thirty years without serious accident. Little remained to be done to complete the discovery of the Passage throughout its whole length. Franklin and his men were confident of being able to accomplish whatever was left to do. CAPT. SIR JOHN FRANKLIN, R.N., the famous Arctic explorer, who sailed from England on May 19, 1845, to complete the North-West Passage. The explorer took with him two ships, the Erebus and the Terror. Though the expedition set out with every prospect of success, not a man of the 129 in the two vessels returned, and few details are known of their fate. And yet the expedition disappeared almost without trace. Not one of the 129 men who sailed in those two ill-fated ships ever came back. More than ten years elapsed before the world had any certain information of their fate. To this day, although the outlines of the catastrophe are now known, many of the details remain obscure. The sketch map shown below - which is based on an Admiralty chart supplied to Franklin when he sailed - shows the apparently simple task which lay before the expedition - the forging of the last link in the North-West Passage. In 1819 Parry, sailing westward through Lancaster Sound, between Baffin Island (S.) and Devon Island (N.) had reached Melville Island (114° W.). But he had found further progress barred by immensely heavy ice-floes that did not break up in the few short weeks of late summer which constitute the only navigable season in the Arctic. On the other hand, successive explorers who had coasted the northern shores of Canada - Franklin himself (1820-1 and 1825-6), Back and King (1833-4), and Dease and Simpson (1837-9) - had traced the coast as far eastward as King William Island (98° W.) and had shown that a ship could be navigated westward from that island all the way to Bering Strait. These two portions of the Passage overlapped considerably and were no more than 400 miles apart. If a channel could be found connecting them, the problem of the North-West Passage would be solved. Franklin’s official instructions, therefore, directed him to make for Cape Walker (74° N., 98° W.) and then to strike south-westward, if possible, for the Canadian coast. If no passage appeared likely in this quarter, he was recommended to try the Wellington Channel (then unexplored), running northward out of Lancaster Sound in about 92½° W. between Devon Island (E.) and Cornwallis Island (W.). At that time many geographers believed in the existence of an open, ice-free Polar Sea; and it was thought that the Wellington Channel might lead into this sea and so give Franklin an opportunity to sail rapidly westward, in a high latitude, towards Bering Strait. Franklin’s ships had just been refitted after their strenuous three years’ work in the Antarctic under Sir James Ross. They were good sea-boats and exceptionally well built. They had originally been “bomb-ketches”, designed to stand the shock of heavy mortars firing from their decks at high elevation. For Polar work they had been still further fortified, their planking having been “doubled”, their frames multiplied and their bows and sterns built up internally until they had become almost solid masses of wood. Under Ross, they had relied on sail alone; but for Franklin's expedition they were given single screws, rotated by a 20 h.p. steam-engine. In a flat calm this would at least give them steerage-way. It was practically the first time that steam-propulsion had been used in the Polar regions. Franklin, who hoisted his pendant in the Erebus, was a capable and enthusiastic officer with a splendid record, but he was fifty-nine - far too old for the work ahead of him. His second-in-command, in the Terror, was Capt. F. R. M. Crozier, R.N., who had filled the same post in Ross’s expedition. The officers were all picked men, and fully shared their leader’s enthusiasm. Some thought that they might win through to Bering Strait and thence to Petropavlosk (Kamchatka) in a single season; none doubted that they would do it in two seasons - by the autumn of 1847. The two ships made their way up the west coast of Greenland and completed their stores and provisions, at the Whalefish Islands, from an accompanying transport. They sailed thence on July 10. On July 26 they were seen, made fast to the ice in Melville Bay (Greenland) in about 74° 48' N., 66° 13' W., by a whaler, the Prince of Wales, which learned that they were waiting for the ice to break up before they crossed over into Lancaster Sound. On or about July 30, 1845, they met another whaler, the Enterprise, which afterwards described them as having been in splendid health and spirits, abundantly supplied with stores of all kinds and impatient to begin their work. The Enterprise turned southward. On that day Franklin and his companions vanished from the sight of civilized men. The year 1846 ran its course without bringing news of the expedition - a disappointment to those who had expected speedy results. When the autumn of 1847 came and went without any tidings, there were some fears for the safety of the expedition. It was true that the Erebus and the Terror had sufficient provisions until June, 1848; but no prudent leader, in such circumstances, would willingly spend the winter of 1847-8 in the Arctic, for the reason that his food supplies would be exhausted, or nearly so, before the breaking-up of the ice freed his ships in the ensuing summer. westward in a high latitude. Pessimists, headed by Dr. Richard King, began to shake their heads and utter gloomy forebodings. King had accompanied Back when Back had discovered King William Island in 1834, and he now did his best to alarm his countrymen by a series of letters to high officials and to the Press. 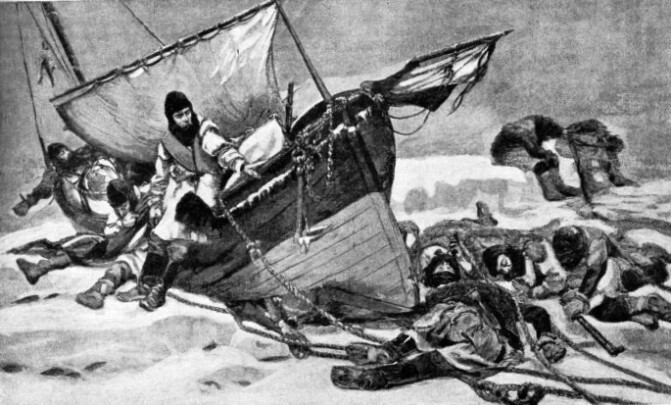 He contended that Franklin and his men were in imminent peril, that the Erebus and the Terror were beset in the ice somewhere to the northward of King William Island, that the crews could never reach civilization again without immediate help, and that the only effective way to help them was to send a rescue-party overland, from the nearest outpost of the Hudson’s Bay Company, down the Great Fish River. King seems to have been a rather boastful man, with an irritating manner; but he was a clear-headed thinker, and in after years he was proved to have been entirely in the right at every point. But in 1847 no one took much notice of him. The Admiralty, however, agreed that it was time something was done; and in the spring of 1848 it sent Capt. Sir James Ross, R.N., with the Enterprise and the Investigator, in search of the missing expedition. Ross’s expedition was a failure - an unfortunate ending to the career of one of the greatest Polar explorers who ever lived. In the autumn of 1848 he reached Port Leopold (in the north of Somerset Island), and there he wintered. Next spring, sledge-parties from the two ships examined a considerable area without finding any traces of the missing ships. One of these parties, led by Ross himself, reached Peel Sound (between Somerset and Prince of Wales Islands), and was, without knowing it, right on the track of the Erebus and the Terror and fewer than two hundred miles from the spot where, a year earlier, they had been abandoned in the ice (see the diagram below). The Arctic summer of 1849 was unusually backward. As the ice offshore showed no signs of breaking up, Ross cut his way out of Port Leopold on August 28 and prepared to renew his search to the westward; but his ships were beset the next day and drifted helplessly out into Baffin Bay. As soon as he could get clear, Ross returned to England. The only real good effected by the expedition was that it gave one of the officers, Lieut. F. L. McClintock R.N., his first experience of Arctic sledging - an accomplishment at which he afterwards became an expert, and by which he enormously extended the area covered by the later Franklin searches. By this time Great Britain was thoroughly alarmed about Franklin and his men. Five years had gone by since they had sailed. If they were not already dead, they must be in desperate need of immediate help. So far, however, no one had even succeeded in discovering any indication of where they might be. And so, in the spring of 1850, a fleet of rescue-ships made its way to Lancaster Sound. The Admiralty sent H.M. ships Resolute, Assistance and Pioneer (steamer) under Capt. H. T. Austin, R.N., and two whalers, the Lady Franklin and the Sophia, under an experienced whaling captain, William Penny. Old Sir John Ross, who had promised his friend Franklin to go in search of him if need be, came northward - despite his seventy-four years - in the Felix, sacrificing his pension to raise funds for the purpose. Franklin’s devoted wife, who had already offered a reward of £2,000 for any news of her husband, sent the Prince Albert, under Commander Forsyth; and two American vessels, the Advance and the Rescue, fitted out by the generosity of Henry Grinnell, a New York shipping magnate, joined the search. Meanwhile, the Enterprise and the Investigator were re-commissioned and sent to Bering Strait with instructions to make their way through the strait and eastward, thus traversing the region towards which Franklin had been aiming. The imposing collection of ships which assembled in Lancaster Sound accomplished little. The searchers devoted their time and energy to the northern side of the Sound, and to the Wellington Channel, and made scarcely any effort to search south-westward from Cape Walker - the direction in which Franklin had been instructed to go. Capt. Ommaney of the Assistance made, it is true, a tentative effort in this direction; but, finding no cairns or other traces along this route, he concluded, as did the others, that Franklin must have gone up the Wellington Channel and been beset far to the northward. It is one of the minor mysteries of the Franklin expedition that, although Franklin’s orders had enjoined upon him to build cairns and deposit records at all prominent points along his route, scarcely any of these have ever been found. For the rest, Austin and Penny quarrelled, and the others dissipated their energies by fruitless searching of the most unlikely quarters. The U.S. ships were beset at the northern end of the Wellington Channel and drifted nearly 1,000 miles before getting free in Baffin Bay. By the end of 1851 all the ships, except those sent to Bering Strait, were home again. The only effective result of two seasons’ work was the discovery at Beechey Island (near the southern entrance to the Wellington Channel) of three graves, some abandoned huts and a pile of empty preserved-meat tins - clear proof that the spot had been Franklin’s winter quarters in 1845-6; but no written document of any kind had been left, and appearances suggested that the station had been hastily abandoned. The excitement soon subsided, however. The Admiralty quickly pointed out that neither of Franklin’s ships had been supplied with a balloon, with the materials for making one, or with the means of inflating it. The perpetrator of the hoax, unfortunately, was not discovered. 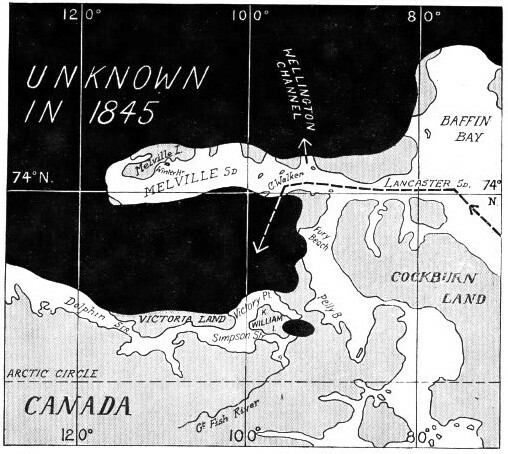 THE RESULTS OF THE FRANKLIN SEARCH EXPEDITIONS between 1848 and 1854 are indicated in this map. The coast-line in heavy outline was unsuccessfully searched - and, in many instances, discovered - by the various expeditions. 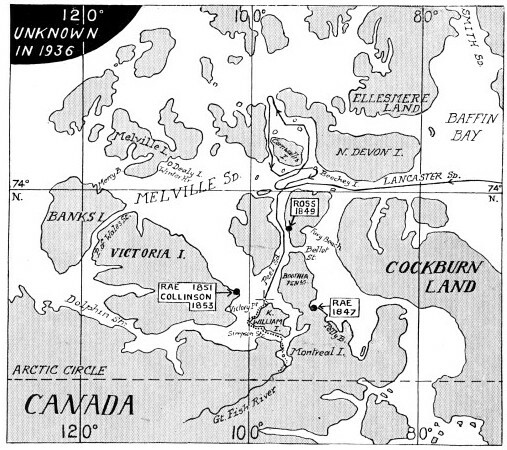 The continuous line coming in from the left of Dolphin Strait shows the track of the Investigator round Banks Island, and the dotted line the route by which her crew completed (partly on foot) the North-West Passage. The cross North of King William Island indicates where Franklin’s ships, the Erebus and the Terror, had to be abandoned, in April, 1848. But a much greater and more justifiable sensation was aroused, in the spring of 1852, by the belated revelation of an almost incredible story which, there is every reason to believe, was perfectly true. In April, 1851, the English brig Renovation, in the course of a passage from Limerick to Quebec, met early one morning a large ice-floe off the Newfoundland Banks. She passed this in clear weather, running about eight knots, at a distance of some three miles. And at about 6 a.m. her mate, Robert Simpson, who was on watch, and a passenger (J. S. Lynch) were afforded an astonishing sight. On top of the floe, not far apart, were two three-masted ships - one heeled over, the other upright. They were painted black and did not resemble wrecks. Their rigging was taut, and their yards were in place. Nor did they seem to be whalers; they were flush-decked. No boats were visible, nor were there any signs of life on board them. To all appearances they were two exploring vessels, whose crews had abandoned them after “snugging them down” and ensuring that they were left in as good and seaworthy a state as possible. They remained visible for about an hour before going out of sight astern, and were seen through the telescope by most of the Renovation’s crew. Unfortunately, her master was sick and would not permit any attempt to close or board them. They were also seen later, in much the same position, by the German brig Doctor Kneip, of Wismar. An account of this extraordinary experience, written by the passenger Lynch, appeared in an Irish newspaper (May 28, 1851), but at the time it attracted no attention. The Admiralty first heard of the matter in March, 1852, when it made a most exhaustive inquiry. That the ships were not optical or other illusions, but had undoubtedly been seen, was definitely established. Inquiries on either side of the Atlantic indicated that they could not have been abandoned whale-ships - the only vessels apart from those of some exploring expedition that could have been in the Arctic regions long enough to have been beset and lifted bodily, by ice-pressure, on to a floe. 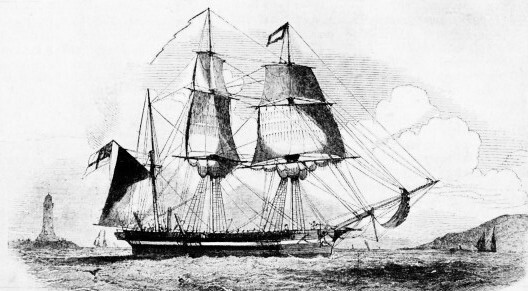 In all probability, then, the two ships seen by the Renovation were the missing Erebus and Terror - in which event her master’s gross negligence had cost him a small fortune; for the Admiralty had offered a reward of £20,000 to anyone who should render assistance to Franklin’s expedition, and £10,000 to anyone who should bring definite news of its fate. The Renovation’s strange story, in any event, gave no clear indication as to the fate of Franklin and his men; and in the spring of 1852 the Admiralty sent out the last of the official search-expeditions. At the same time it made the extraordinary announcement that “We consider no further exploration . . . to the southward of Cape Walker necessary, and therefore propose that all the energy of the expedition be directed towards the exploration of the upper portion of Wellington Strait.” Captain Sir Edward Belcher, R.N., who had had no Arctic experience, was appointed leader. He spent two years in the Wellington Channel with five ships. He then abandoned four of them and returned to England (September 28, 1854). For this action he was duly tried by court-martial. His official instructions, however, had given him such wide discretionary powers that the Court felt compelled to acquit him. He was never employed again. On the other hand, two of his officers, Commander Sherard Osborn (whom he had put under arrest) and Lieut. May (whom he had severely censured) were immediately promoted. THE STEAM AND SAILING SHIP PHOENIX was one of several ships fitted out to search for the lost Franklin expedition. The first party sent by the Admiralty to find the missing explorer left England in the spring of 1848. This party, conducted by Capt. Sir James Ross, R.N., under whose command were two ships, returned empty-handed. The one bright spot in Belcher’s expedition is the wonderful work done by the sledging-crews led by McClintock, and by other officers trained in his methods. Small parties of men, dependent entirely on their own exertions and dragging sledges uncomplainingly through snow and slush for weeks at a stretch, in low temperatures, at an average rate of fifteen miles or so a day, would leave the ships, and before they returned cover a mileage that often ran into four figures. In the spring of 1853, for example, McClintock sledged 1,400 miles in 105 days, and Lieut. G. Y. Mecham, R.N., 1,163 miles in 94 days. In the following spring Mecham made two other journeys of 1,157 and 1,190 miles respectively. If such men had only been sent to the region which Franklin had been specifically directed to explore, and not in the opposite direction, they could not have failed - as they did - to pick up the trail of the. lost expedition (see the diagram above). It is pleasant to turn from this protracted, gallant bungle to the activities of the Enterprise and the Investigator, which had been sent to Bering Strait in 1850 with orders to begin their search for Franklin from the Pacific end of the North-West Passage and work eastward. As with all the naval vessels sent in quest of Franklin, these two failed in their main object; but the crew of the Investigator completed the North-West Passage, and the Enterprise performed a feat of navigation never accomplished before or since. The Investigator, under Comdr. 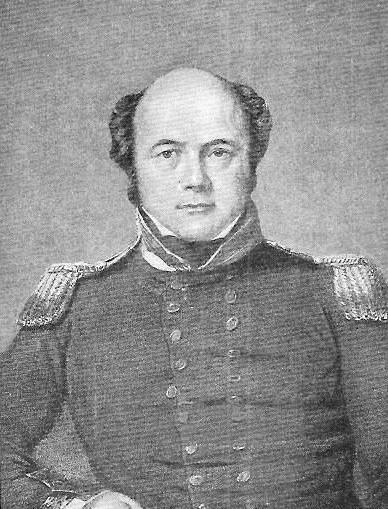 Robert McClure, who had been her first lieutenant in Ross’s 1848-9 expedition, left England on January 20, 1850, in company with the Enterprise. The two ships accidentally parted company in the Pacific and did not meet again during their voyage. McClure, after the passage through Bering Strait, pushed eastward along the northern coast of the continent as far as long. 130° W., and then steered north-eastward for Melville Island. He discovered a narrow strait (Prince of Wales Strait, between Banks and Victoria Islands) running exactly in this direction, and stood boldly along it. But after having got within thirty miles of Melville Sound he was held up by heavy pack-ice. The navigable season then being practically over, he took the hazardous step of remaining where he was and wintering in the pack itself. Before winter set in, McClure made a sledge-journey which showed conclusively that no land - nothing but pack ice - intervened between the head of Prince of Wales Strait and Melville Island - which Parry had reached by sailing westward. It was the last link in the North-West Passage - or, at least, in a North-West Passage. A FRANKLIN RELIC. 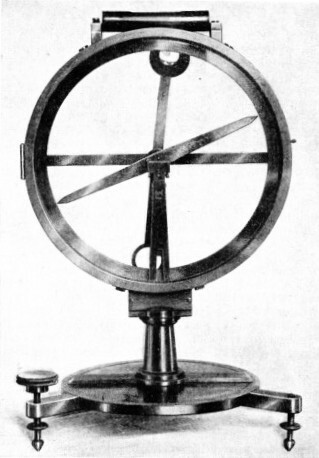 This sextant belonged to Frederick Hornby, mate of the Terror. It is now in the Royal Naval Museum at Greenwich. Next spring (1851) three sledge-parties explored the district without finding any traces of the Franklin expedition. When the ice broke up in July, McClure, unable to force his way into Melville Sound, put his ship’s head round - determined to win his way through, if he could, by sailing back down Prince of Wales Strait and then to the north-eastward along the western coast of Banks Island. This he did. It was an extraordinary feat of seamanship. He took the Investigator - a slow, deep-laden sailing-ship, in the face of terrific ice and weather conditions and at imminent risk of total loss, round a precipitous and iron-bound coast along a track of which only the southern half has ever been traversed again - and then by a steamship. In the end, however, the pack-ice beat him when he was only some fifty miles from Melville Island. As a last resource, he took refuge in Mercy Bay, on the north-east coast of Banks Island. There the sunken wreck of the Investigator still lies. For she never got free. A winter (1851-2) went by, and then another (1852-3). Still McClure remained immovably locked in the ice. Meanwhile he had crossed on foot to Winter Harbour, Melville Island, where he found a note left by McClintock (then of Austin’s expedition) in June 1851, and deposited another, stating his own position. Scurvy broke out on board the Investigator, and by the spring of 1854 more than half of her men were seriously ill. But McClure’s heart was set on completing the Passage with his ship. He planned to keep thirty men with him to spend a fourth winter - if the ice did not break up - and meanwhile to send the remainder away overland, in two parties, to the Mackenzie River (Canada) and to Lancaster Sound. They were due to start on April 15 - and it is safe to say that, in their enfeebled condition, not a man would have lived to tell the tale; but relief came at the last moment. McClure’s note, left at Winter Harbour, had been found by Belcher’s expedition; and on April 6, 1854, Lieut. Pim of the Resolute reached Mercy Bay over the ice with the news that help was near at hand. A DIP-NEEDLE used by Capt. Sir John Franklin, R.N. 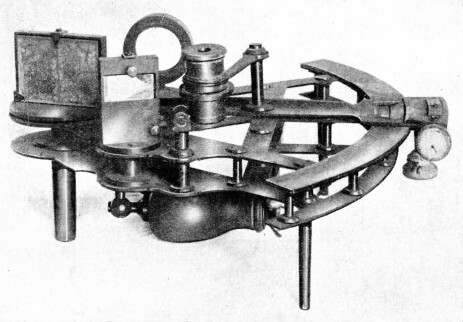 This navigational instrument is used for finding the inclination of the lines of magnetic force. At the two Magnetic Poles the needle stands vertically; at the magnetic equator (roughly equidistant from these Poles) it lies horizontally; and at intermediate points its inclination gives a measure of the observer’s distance from the (magnetic) equator and the nearest (magnetic) Pole. Even then, McClure was anxious to stay by his ship, but he could not find thirty volunteers to remain with him. Ultimately he was compelled by direct orders from Kellett, Belcher’s second-in-command, to abandon her. The officers and men of the Investigator travelled eastward on foot, joined up with Belcher’s squadron and returned with it to England. They were awarded, and well deserved, a Parliamentary reward of £10,000 for the discovery of a North-West Passage. In addition, McClure was promoted and knighted. In its way, the performance of the Enterprise (Capt. Richard Collinson, R.N.) was no less remarkable than that of the Investigator. Collinson passed through Bering Strait later than his subordinate and, finding himself unable to make much progress eastward, turned back to winter at Hong Kong. Next spring (1851) he followed in the track of the Investigator along the Canadian coast, up Prince of Wales Strait (where he found a notice left by McClure) and down again, wintering at the southwest entrance of the strait. In the following season (1852) he took his ship through Dolphin Strait (between Victoria Island and the mainland) and wintered (1852-3) on the south side of Victoria Island. Wherever he went he sent out sledge-parties, but none of these succeeded in finding any unequivocal traces of Franklin. One party, however, got almost within sight of the western coast of King William Island, where, if they had known it, lay the skeletons of the men they sought. Finally, Collinson turned back for Bering Strait, spending a third winter (1853-4) at the mouth of the Mackenzie River. Collinson’s voyage is one of the most remarkable ever made in the Arctic. During a three-years’ absence from civilization he took his ship eastward along the Canadian coast farther than anyone before or since, navigated her successfully through straits that no other vessel has ever dared to enter, and brought her safely home. All this he accomplished almost single-handed. When the Enterprise reached England it was learned with astonishment that most of her officers had long been under arrest - two of them for more than two years, and one for nearly three. Collinson, a rigid disciplinarian, had found differences arising among his officers, had tried to adjust them and had failed. Arrests were the natural sequel; and, once placed under arrest, the officers had remained so - as long as the Enterprise was alone in the Arctic there was no possibility of convening a court-martial to try them. They must have found life incredibly boring - and Collinson must have done with little sleep. The arrested officers were never brought to trial, the Admiralty considering that this would be inadvisable. Collinson never applied for further employment afloat. None the less, it should be remembered that of all the naval vessels that went in search of Franklin, the Enterprise came nearest to success. AT THE END. A vivid impression of the last of the ill-fated expedition. After the ships had been trapped in the ice on the west side of King William Island, they were abandoned in desperation on April 22, 1848. Sir John Franklin had died on June 11, 1847. Within three days - such is the irony of Fate - the same paper, and others, published the first authentic tidings of the Franklin Expedition. The news had been brought by Dr. John Rae, an employee of the Hudson’s Bay Company. Rae had spent many years of his life in northern Canada and was one of those gifted hunters who can “live off the country”, in apparently barren regions, for months or even years at a stretch. He had already taken part in two overland searches for Franklin, during one of which (1847) he must have been within 150 miles of the Erebus and the Terror while their crews were still on board the ships. On this occasion, in the course of his ordinary duties, he had accidentally solved the problem of Franklin’s fate. Four years earlier (that would be 1850, but it proved later to be 1848) the Eskimos had seen a party of some forty white men, all very thin, dragging a boat southward, over the ice, near the west shore of King William Island. None of them could speak Eskimo, but by signs they indicated that their ships had been wrecked. Later in the same year, the natives found the dead bodies of some thirty of the white men at a spot on the north shore of the Canadian mainland, and five other bodies on an island not far away. This was only hearsay evidence - Rae did not think himself justified in disregarding his orders and visiting the spot for himself - but he bought from the natives, and afterwards took to England with him, a number of relics, that had been collected. And their testimony, if mute, was none the less eloquent - convincingly so. There were watches, parts of telescopes, of compasses and of firearms, and - most important of all - some silver spoons and forks with arms engraved on them which indicated that they had belonged to some of Franklin’s officers. Rae secured also a round silver plate on which was engraved “Sir John Franklin, K.C.B.” (an engraver’s error for “ K. C. H.” - Knight Commander of Hanover), with Franklin’s Star of the Hanoverian Order. During Rae’s absence in England, the Hudson’s Bay Company sent one of its chief factors, James Anderson, down the Great Fish River to search for further traces of Franklin’s expedition. The search,- made in the summer of 1855, was singularly ineffectual. To show how Anderson was equipped, it is enough to note that he had a short allowance of provisions, no proper map and not a single person with him who could speak Eskimo. He reached the mouth of the river and then returned, having found nothing except a few scraps of wood and clothing. Although the scene of the catastrophe - King William Island - was now definitely known, the Admiralty declined to make any further search, considering that, since Franklin and his men had certainly perished, it was not justified in exposing more officers and men to similar risks. After some delay, the reward of £10,000 offered for the first news of Franklin’s fate was paid to Dr. Rae. No further official action was taken. But the indomitable Lady Franklin, although impoverished - she had already furnished most of the funds for two private search-expeditions - took a different view. It was still possible that one or two survivors might be living among the Eskimos, unable to get back to civilization across the barren Canadian wastes. At all events the Franklin expedition’s records ought to be found, if possible, and the bodies of the dead given decent burial. If the Admiralty would not attempt to do this, she would; and she did. AN ESKIMO CAMP near Coronation Gulf, Canadian North West Territories. Dr. John Rae, an employee of the Hudson’s Bay Company, took part in overland searches for the lost Franklin expedition. In 1854 Dr. Rae met some Eskimos who told him of white men they had seen, suffering from starvation and dragging a boat southward over the ice. The Eskimos later claimed to have found bodies of the explorers. Dr. Rae also bought a number of relics from the Eskimos, including a silver plate which had belonged to Sir John Franklin. Helped by sympathetic friends, Lady Franklin raised enough money to buy and equip the little steam-yacht Fox (177 tons). Her commander was Capt. F. L. McClintock, R.N., who had taken part in several of the official searches and who was the greatest living authority on Arctic sledging. He had been lent by the Admiralty, as had the second-in-command, Lieut. W. R. Hobson, R.N. Capt. Allen Young, of the Mercantile Marine, who had declined all pay and contributed £500 to the expenses, went as third officer. The Fox sailed on July 1, 1857, bound for King William Island. The start of the voyage was unfortunate, and almost disastrous. In Melville Bay the little Fox was beset by heavy pack-ice and drifted helplessly for more than eight months. During this time she covered 1,385 miles and was several times almost destroyed. Nothing, however, could discourage McClintock, and when he had extricated his ship he headed for Lancaster Sound again. This time he got safely through, and after calling at Beechey Island he wintered (1858-9) in Bellot Strait (between Boothia Peninsula and Somerset Island), about 200 miles from King William Island. This would be within easy reach, next spring, of such sledge-parties as he could organize. Next spring, accordingly (April 2, 1859) two main parties left the Fox. 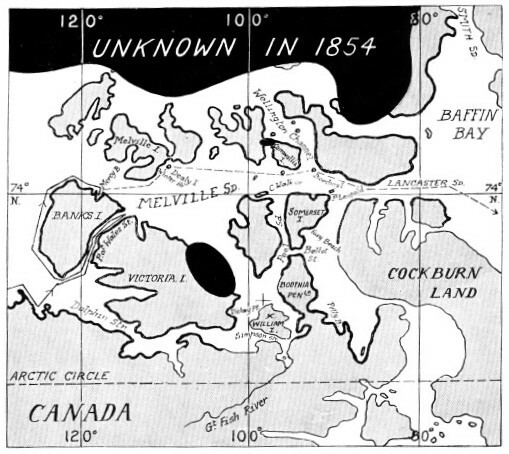 One led by McClintock searched the eastern coast of King William Island and went as far as Montreal Island, in the estuary of the Great Fish River. The other, led by Hobson, examined the western shore of King William Island. It is typical of McClintock that he should have allotted the western coast - the most likely place to find relics - to his junior officer, knowing that success would ensure Hobson’s speedy promotion. So it proved. McClintock, in his journey to Montreal Island, found one or two small relics and bought some more plate from the natives. On his return by the western coast of King William Island (already searched by Hobson) he found several unburied skeletons (two in an abandoned boat, mounted on a sledge) and several depots of discarded clothing and equipment. To Hobson had fallen the honour of discovering, in a cairn at Victory Point, a written record signed by Crozier himself - the first and last direct information from the Franklin Expedition that has ever come to light. By June 27, 1859, the parties were safely back on board the Fox, and when the ice broke up McClintock set sail for England. His trials were not over yet - both his engineers had died, and without the help of steam it seemed unlikely that he could get his ship out of the pack before winter set in. Nothing daunted, he took charge of the engines himself and stood at the throttle for twenty-four hours continuously while Hobson and Young conned the ship. No other man on board could have done it. T he Fox reached Portsmouth on September 21, 1859, and was welcomed as warmly as such a gallant and successful expedition deserved. Parliament voted £5,000 to Captain McClintock and his men, and £2,000 for the erection of a statue to Franklin (now in Waterloo Place, London). McClintock also received a knighthood and rose to the rank of Admiral on the active list. He died in 1907. FOUND IN 1859. The only written record left by the Franklin expedition was discovered by Lieut. W. R. Hobson, R.N., of the Fox, which sailed in 1857 on a privately financed search for the lost explorers. The record, found at Victory Point, King William Island, had originally been deposited there in a tin cylinder in June, 1847. The cylinder had been reopened in April, 1848, and an additional message written round the margin of the paper. Full transcriptions of the two messages will be found below. The record found by Lieutenant Hobson at Victory Point is tantalizingly brief and curtly formal in manner. It could scarcely have been otherwise. It was written, in circumstances of great difficulty, on the narrow margin of a printed form intended to be left for the information of later explorers and bearing a request, in six languages, that the finder would return it to the Admiralty. It was originally deposited (in a tin cylinder) in June, 1847. The cylinder had been re-opened, and an additional message had been scribbled round the margin, in April, 1848 - after the Erebus and Terror had been abandoned. This second message is in the handwriting of Commander James Fitzjames, Franklin’s executive officer in the Erebus. 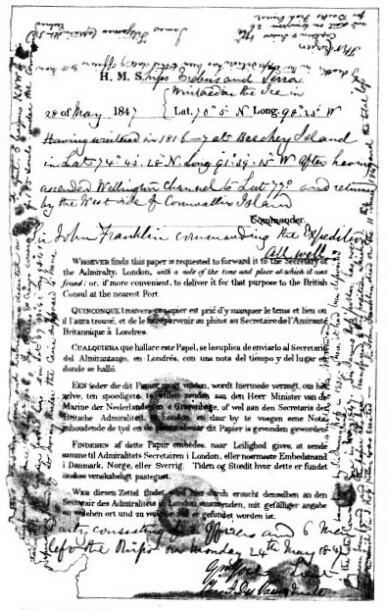 The original document is in the Naval Museum, Greenwich. Here is the full text (portions in brackets are conjectural, the paper having been eaten away by rust). 28 of May, 1847 H.M. Ships Erebus and Terror Wintered in the Ice in Lat. 70° 5' N. Long. 98° 23' W Having wintered in 1846- 7 at Beechey Island after having ascended Wellington Channel to Lat. 77° and returned by the West side of Cornwallis Island. Sir John Franklin commanding the Expedition. All well. Party consisting of 2 Officers and 6 Men left the Ships on Monday, 24th May, 1847. Chas. F. Des Voeux, Mate. (April 25) 1848. - H.M. Ships Terror and Erebus were deserted on the 22nd April 5 leagues NNW of this (ha)ving been beset since 12th Sept. 1846. The Officers & Crews consisting of 105 souls under the Command of (Cap)tain F. R. M. Crozier landed here - in Lat. 69° 37' 42" Long 98° 41'. (This) paper was found by Lt. Irving under the Cairn supposed to have been built by Sir James Ross in 1831 4 miles to the Northward - where it had been deposited by the late Commander Gore in June 1847. Sir James Ross’ pillar has not however been found, and the paper has been transferred to this position, which is that in which Sir J. Ross’ pillar was erected - Sir John Franklin died on the 11th June 1847 and the total loss by deaths in the Expedition has been to this date 9 Officers & 15 Men. Captain & Senior Offr. and start on tomorrow 26th for Back’s Fish River. The last sentence, added by Crozier, is perhaps the most pathetic of all. He was heading for the Fish River - which Dr. King had vehemently and vainly indicated in 1847, before the ships were ever abandoned, as the inevitable route of the expedition’s retreat, and the region to which assistance ought to be sent forthwith. With the help of the information given by this invaluable record, Franklin’s route can be plotted with fair accuracy. In their first sea son, the Erebus and the Terror did go up the Wellington Channel (presumably finding their advance to the south-westward blocked by ice) and returned by its western shore. Incidentally, it is a remarkable fact that, at the time when the record was discovered, no one then living knew that Cornwallis Island was an island, all the search expeditions having remained under the impression that it was a peninsula. Franklin had wintered at Beechey Island, after a magnificent first season’s work, in 1845-6 (the “1846-7” of the record is an obvious slip of the pen). Next summer he had presumably found Peel Sound open and had sailed down it. It must have been on reaching the northern extremity of King William Island that he took a decision which, although warranted at the time, sacrificed the lives of all on board. If he had steered round the eastern coast of the island he would have found his way into Simpson Strait (between the island and the mainland). He would have completed the North-West Passage and - as Collinson did afterwards - have proceeded westward to Bering Strait. This was done, in 1903-5, by Amundsen in the Gjoa - the only ship which has ever passed from the Atlantic to the Pacific along the North-West Passage. But in Franklin’s time King William Island, as well as Cornwallis Island, was regarded as a peninsula, with no strait on its eastern side. So he headed his ships south-westward and became hopelessly beset in a region which is now known to be unnavigable at any season. There the ships lay until, in desperation, they were abandoned. Such is the sum of what we know about the Franklin Expedition. There are many questions left unanswered. For example, what possessed Crozier to make for the Fish River when he could more easily have crossed to Fury Beach, where, to his own knowledge, were many tons of stores of all kinds, and where he would have had much more chance of getting help from the whalers of Lancaster Sound? Why did he start long before he could hope to meet with any game? Did he die with his men, or is there any truth in the traditions collected by C. F. Hall (an American explorer), that, knowing Eskimo ways and the Eskimo language, he survived the disaster and lived the life of a native for some twenty years? Who were the two men whose headless skeletons McClintock found in the boat? Why had each fired a single shot? Had the Eskimos, as they claimed, assisted the starving stragglers - or had they murdered them? Or blanched and blown about the grass. Some of the survivors certainly reached Montreal Island at the mouth of the Fish River. One or two may have got some way up, but none came back to civilization, and probably none ever could have done so. A small, healthy party of trained hunters might, as was shown later by Rae and Schwatka (who re-searched King William Island in 1879), have come and gone between King William Island and the nearest outpost of the Hudson’s Bay Company with perfect safety. For a large party of men, most of them scurvy-ridden, short of food and encumbered with heavy boat-sledges, to attempt such a journey was utter madness. Had they kept to their ships and sent a few of the fittest men to the shores of Lancaster Sound on the chance of sighting a whaler, there might have been some hope; but they abandoned their ships, and Hobson found ominous evidence that they attempted to travel when too heavily overloaded. Strewn about near the cairn where the record was found were hastily-abandoned articles. There was a heap of clothing 4 feet high, which the party had found impossible to carry for more than the fifteen miles they had covered. There were also four heavy sets of boats’ cooking stoves, shovels, pickaxes, iron hoops, long pieces of hollow brass curtain rods, and a copper lightning rod - an accumulation of dead weight that was likely to break the hearts of men travelling in the Arctic. There was similar tragic evidence of overloading in the boat discovered by Hobson. In addition to clothes and lighter articles there were nails, saws, bullets, shot and even two rolls of sheet lead. The men who started with such loads were fated. And now the western coast of King William Island is dotted with graves that show where they fell down and died. THE NORTH-WEST PASSAGE AS IT IS KNOWN TO-DAY. The continuous line shows the route of Franklin’s ships, the Erebus and the Terror, in 1845 and 1846. The dotted line shows the route followed by their crews while making for the Great Fish River after the vessels had been abandoned. The large black dots indicate the nearest approaches by the official search parties to the lost Expedition. The fate of the Erebus and the Terror, too, is entirely uncertain. The Eskimos told McClintock that the two ships drove ashore, and were wrecked, on opposite sides of King William Island. He never succeeded in seeing a vestige of either wreck for himself. What is more remarkable, he did not come across a single piece of wood in Eskimo possession that might have formed part of either ship. This fact alone casts grave doubt on the natives’ veracity. No white man who has visited the locality, from McClintock down to Major Burwash - who was there in 1926 and flew over it in 1930 - has ever discovered anything to show that the ships were wrecked near King William Island. In such circumstances there is much ground for believing that the ships seen on the floe by the Renovation were the missing Erebus and Terror, and that the slow drift of the ice had carried them into Barrow Strait and thence westward and southward to Newfoundland. The same thing is known to have happened to the Resolute, of Belcher’s squadron. She was abandoned at the western end of Barrow Strait, in lat. 74° 40' N., long. 101° 20' W., in May, 1854, being then firmly beset. She was picked up, floating freely, off Cape Mercy, Davis Strait, by an American whaler named Buddington. She was not far from the Atlantic, and had covered nearly 1,000 miles from the spot where she had been abandoned. There is nothing improbable in supposing that by some freak of fortune the Erebus and Terror may have done the same. They would not necessarily have sunk when the floe carrying them melted; such immensely strong wooden ships would probably still float, awash or little more, until they fell to pieces or were driven ashore. Where did they go? Did they drift round and round the North Atlantic, as other derelicts have done, for years? Did they go back northward again - or southward, to the Antarctic? Did they find a last resting-place somewhere in the Pacific, as the ships of La Perouse, the French Franklin, did at Vanikoro? Or are they still afloat? H.M.S. PLOVER, one of the many naval vessels despatched in search of Sir John Franklin’s expedition. 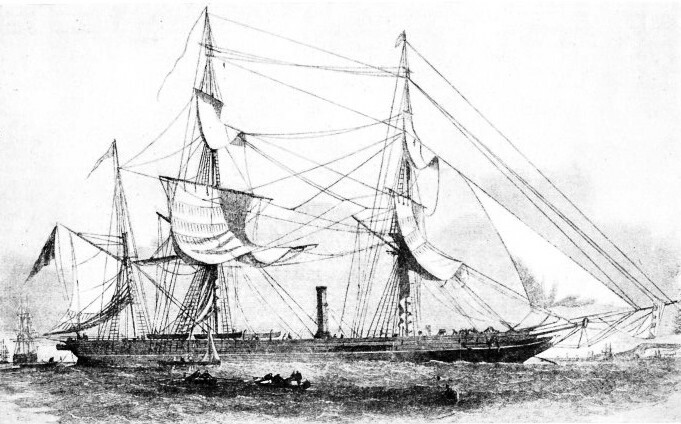 After many attempts to solve the Franklin mystery, the Admiralty declined to send further ships to the North-West Passage, but, aided by sympathetic friends, Lady Franklin herself fitted out a ship, the Fox, which sailed in July, 1857, for King William Island. One of her officers finally discovered in a cairn at Victory Point the two messages left by the explorers. You can read more on “Epics of Exploration”, “Ross in the Antarctic” and “Supreme Feats of Navigation” on this website.